Weather changes quickly in the high-country and this Marmot Hyper jacket shell can be a huge asset when rain, wind, and dropping temps set in. Most of this writers gear evaluations and recreation occur at elevations of more than 8,000 ft. For some reason alpine terrain and beauty never cease to compel me back. Early morning starts at the trailhead are often quiet chilly, even when the weather forecasts indicates a warm, sunny day. Perhaps, the first characteristic about the Marmot Hyper jacket that promised good things is its light weight at less than 12 ounces. Next was the stretch-capacity of the fabric and freedom of movement. The indication right out of the gate was the Hyper fabric cut, construction, and design would move with you. And that turned out to be the case. You get so much versatility with a waterproof, windproof, and packable jacket shell such as the Hyper promises to be, that it quickly can become a standard item in the backpack or daypack. And this Hyper jacket was on the trail on a weekly basis for several months. Sometimes it was needed, other times it stayed in the pack. But it was onboard every trip. Originally, the intention was to test the Marmot Hyper on a multi-day backpack nine-miles into the Palisade Glacier above Big Pine in the High Sierra. Work and severe backcountry weather prevented us from taking that trip in the window of time we had planned for. So we settled for our local high-country treks that offer every bit of the alpine environment the Sierras have, just not as extreme nor as far away from civilization. Hyper Jacket hood is roomy and adjustable front and back. As a hooded outer shell, we also found the Marmot Hyper to really lend itself well to wearing a light down jacket or vest underneath at times when the chill and wind started working on the body heat. If you’re thinking about investing in the Marmot Hyper Jacket (it retails at $200 US), you might consider ordering a size larger so you can add layers of insulation as the conditions require. Because the Hyper offered a solid barrier to wind and rain, yet remained extremely flexible without hindering body motion or arm movement, we found the Hyper to be a really good shell choice for using underlying layers of warmth. There are so many waterproofing technologies on the market today, and many really good ones at that. But Marmot’s MemBrain Strata shell fabric technology eliminates the need for three-layers of material in its construction while remaining breathable and, very lightweight. At 20,000mm of waterproof performance, the MemBrain Strata is about as close as you can come to being watertight. It would take gale force winds driving rain or sleet onto your Hyper-clad frame to even begin to force moisture through the shell barrier. A waterproof fabric such as the MemBrain Strata is, with a weight factor close to nothing, truly lends the Marmot Hyper Jacket to so many types of outdoor applications as trail running, hiking, mountaineering in mild conditions, long-range backpacking, and ultra-light backpacking. We enjoyed the attached hood. As an integral part of the Hyper Jacket, the hood has a slightly stiff bill built in to offer resistance to rain and wind. The hood is roomy enough to accommodate a baseball cap, under-layer hood, or a gigantic head. You can snug up the Hyper hood with the draw cord pull tabs and adjust the level of snugness with one hand. Marmot Hyper Jacket chest pocket and front zipper are water resistant, and worked fine. Positioned in the upper left hand side of the Hyper is a chest pocket with enough room to keep a small GPS unit, lightweight gloves, or any gear item you’ll want quick access to. As with the full-length front zipper, the chest pocket zipper is water resistant. But it would have to be a drenching, driving rain, for moisture to get in. That said, during the trips where we did get into driving rain and wind, the water resistant zippers used as closures on the Hyper Jacket did a stellar job of keeping water outside the garment. At the cuffs Velcro is used to adjust snugness about wrists. Velcro is so versatile, and in this case you can adjust the cuffs for wearing gloves, keeping the wind out, or even retaining the Hyper Jacket sleeves higher up on your forearms to keep your hands free of the sleeves when working with a camp stove, setting up a bivouac site, or actually working with your hands for a myriad of reasons. On the interior of the Marmot Hyper Jacket, mesh-web inner panels facilitate ventilation and act as a barrier to keep the waterproof torso section off the body. Taped seams throughout the construction of the Hyper Jacket run about a quarter-inch on each side of the fabric seams. This is great in keeping the weight down and enhancing the waterproof function the nylon MemBrain Strata fabric. 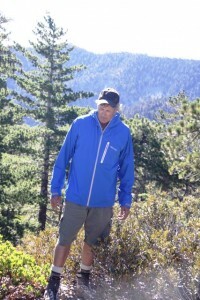 Can’t say enough, about this MemBrain Strata fabric as it is used in this Hyper Jacket and throughout the 2011 Marmot mountaineering, skiing, hiking, and general outdoor lifestyle apparel lineup. As mentioned in the beginning of this review, it was the lightweight and freedom of movement built into the Marmot Hyper Jacket that caught my attention, everything else about it just kindly fell into place. Yes, the Hyper Jacket is recommending as a constant piece of kit for mild-to-suddenly wicked weather that the weather forecasts couldn’t predict. Hyper is so light and functional that it should have its own pocket in your pack. 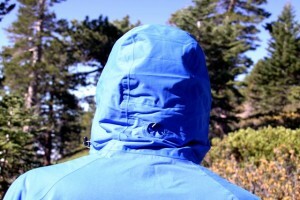 Attached Hood – Offers extra warmth layer under a heavier shell hood or by itself. Marmot Hyper studio shot. MSRP $200. Hyper hood and collar use chord and lock tabs to adjust fit. Hyper is lightweight, packable, waterproof and versatile. 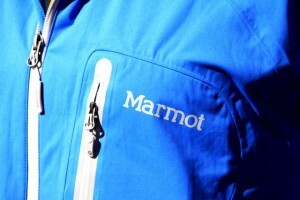 Reflective Marmot logos aid in night and low light conditions. Hyper rear hood adjustment tab. Velcro cuff adjusment snugged up. Water resistant zippers worked well every time. Water resistant zipper and hand warming side pocket. Marmot Hyper cuffs use Velcro to adjust fit.